We are the only play facility in the area with this revolutionary new product that eliminates germs and bacteria on contact. You can feel confident bringing your children to play. In addition, we will continue to do our thorough cleaning daily. This is just an added layer of protection that we are proud to have! Our goal is to provide you and your family with a safe, germ and bacteria free place to play. 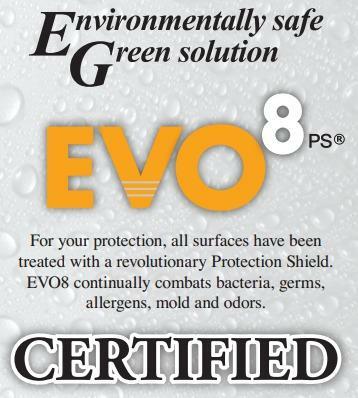 EVO8 is a revolutionary, ALL GREEN, protective shield that will protect all surfaces from germs, allergens and bacteria. EVO8 protective shield creates a molecular bond with all surfaces to continuously battle germs, allergens and bacteria from returning 24 hours a day, 7 days a week. If you have any questions, please do not hesitate to contact one of our staff members for more information.